What Does the Jack Mode Warning Light Mean? The jack mode warning light lets you know when your car is suspended at a certain height, which may make it easier to perform service or repair on it. Height adjusting suspensions were first introduced in the 1950’s as a way to keep the car level regardless of how much weight is being carried. Adjustable suspension never really picked up until more recently and it now has multiple applications. With adjustable suspension, SUV’s and trucks can raise and lower themselves to make the vehicle easier to get into or so that there is more clearance when off-roading. Even sports cars can benefit from adjusting suspension by hunkering down at higher speeds to improve handling or by raising the nose of the car to get over speed bumps. Most modern systems adjust themselves automatically so that the driver can focus on the road. However, this can make repairs a little tricky, especially if it’s the suspension that needs to be worked on. Therefore, automakers have programmed a “jack mode” into the car which locks the suspension at a certain height that will not be adjusted until the jack mode has been turned off. This light will look different depending on the vehicle so refer to the owner’s manual of your car so that you know what to look for. Whenever this light is illuminated, the vehicle’s suspension will not change its height allowing repairs to be performed safely. Jack mode can be disabled manually or will usually deactivate after accelerating more than four or five miles per hour. If this light comes on while you are driving, try restarting the engine once you have pulled over and parked safely somewhere. You’ll need the help of a qualified technician if the jack mode cannot be deactivated as then there it is likely to have a malfunction present. Is it safe to drive with the jack mode warning light on? The jack mode only prevents the suspension from adjusting its height but the suspension will still be able to absorb bumps and knocks in the road like normal. 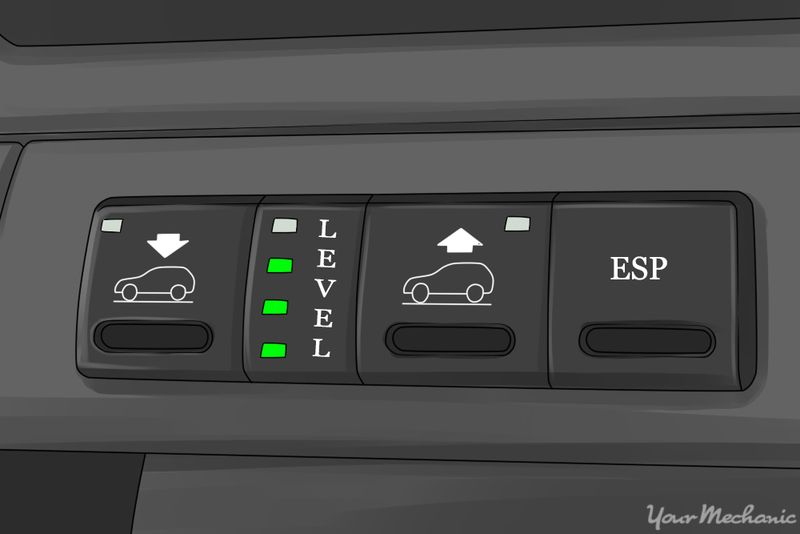 However, depending on the type of car, having jack mode enabled all the time could make it difficult to get in and out of parking lots. If this light refuses to turn off, you should have it diagnosed further as it could be an indication of a more serious problem. Our certified technicians are always available if you are experiencing any issues with your adjusting suspension system. Q: Need to know where to place the jack. Q: What does the low windshield washer fluid level Warning Light mean?